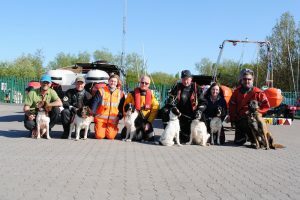 The first was on the River Wey, in Guildford, when Mike Dermody and his dog Quincy along with Dave Marsh and his dog Sasha were asked to participate in a search for the missing kayaker Grant Brooster. Within a short period of time, this was quickly followed by a search of the River Thames in Culham, Oxfordshire undertaken by Dave and Sasha, looking for the missing teenager, Ellis Downes. Both searches resulted in positive indications with the results being fed into search management on both occasions. Following on, two trainee members Philip Eichmann and Georgina Armstrong, along with their dogs, attended the Poole Boat Show, supporting Hypro Marine as a way of thanking them for their support over the last twelve months. Hypro Marine have supplied one of their Takacat boats and an LEHR LPG engine for training purposes on an open loan basis. 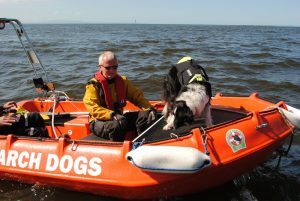 The boat is perfect for the dogs to work from because it sits low in the water and has an open front, enabling the dog to get as close to the scent as possible. The dogs are so comfortable on it too. They thoroughly enjoyed themselves (and the handlers did to!) and despite the rain it was a successful day. Hypro Marine are keen supporters of SAR and will offer a discount to any team who wishes to use them, they provide the Takacat in different sizes, inflatable and also solid hull, they also provide petrol and LPG engines. Help like this is so important to us and we are so grateful for their support. Next on the busy calendar was a trip across to Newcastle [Northern Ireland] for a three day training exercise. The main purpose of this weekend was to meet up with a representative from New South Wales by the name of Sue Pritchard. Sue is an Emergency Planner over in Australia and had journeyed across to participate in our training as part of a structured set of visits worldwide with her viewing various dog sections and training methods via a Churchill Fellowship. During the course of her travels, she had [or planned] to visit Virginia [USA], New Zealand; England; Ireland; Ireland North; and Switzerland, so we are looking forward to reading her findings from all of her information gathering. SARDA Ireland North are now looking ahead to mid July, which will see representatives from Technisches Hilfswerk, Germany. THW is a Federal Office for Civil Protection and Disaster Assistance. The THW comprises 668 THW local chapters, 66 offices, 8 regional associations, and the THW administration in Bonn. It consists of the management staff, the representative for the volunteers, and the Deployment Section with the units E1 mission, E2 foreign, E3 training, E4 logistics, and E5 technology, and the Central Services Section with the units Z1 helpers and staff, Z2 organization, Z3 finance, Z4 security and health protection, and Z5 information and communication. 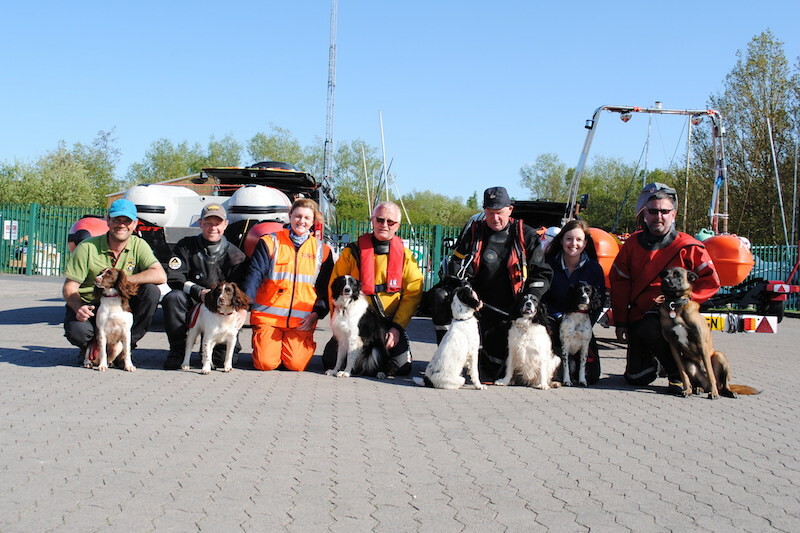 Their members are participating in a three day training course understanding the mechanics of how SARDA Ireland North successfully train their dogs for Water Search.